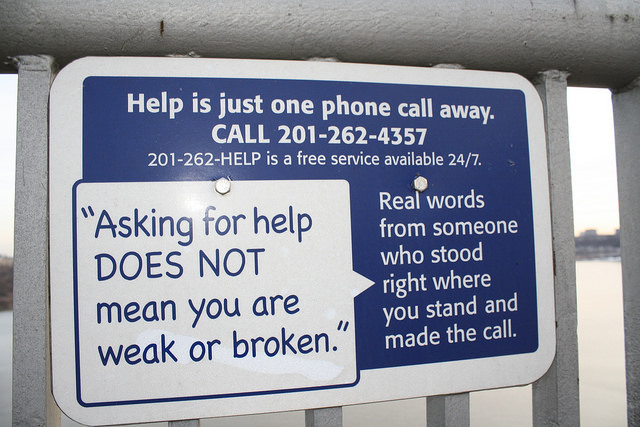 Numerous signs along the guardrail of the George Washington Bridge beckon people to call a hotline if they feel suicidal. Over the past 7 years, roughly 100 people have jumped to their deaths at the bridge. Photo by Razi Syed. 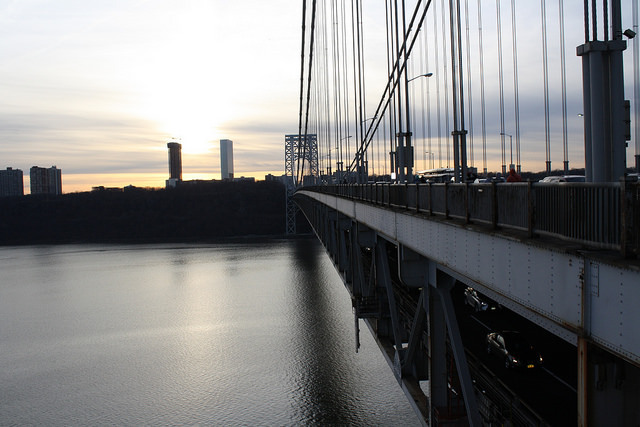 As pedestrians and cyclists traverse the roughly one-mile long pathway of the George Washington Bridge, they look over the breathtaking view of high-rise buildings on either side and the Hudson River down below. But at various points along the guardrail, blue signs with bold white lettering for suicide hotlines draw attention to a disturbing part of the bridge’s recent history: the roughly 100 people who have jumped to their deaths during the past seven years. Suicides have been a fixture at the George Washington Bridge since the high-profile death of Rutgers University student Tyler Clementi in 2010. After 2011, when three people died, the loss of life along the pathway spiked dramatically. Last year, 12 people jumped to their deaths from the bridge, along with 70 people who were stopped in the middle of an attempted jump. There were 18 people who died at the bridge each year in 2014 and 2015. The bridge, which connects Washington Heights, Manhattan on one side and Fort Lee, New Jersey on the other, sees a suicide attempt on average every three to four days. The bridge is operated by the Port Authority of New York and New Jersey. For years, researchers have argued in favor of installing barriers or other obstructions at high-profile sites. After almost a decade of consideration, construction began this month on a suicide prevention net at San Francisco’s Golden Gate Bridge, which has had more than 1,500 deaths since it was built around 80 years ago. Since many suicides are the result of a temporary period of disordered thinking, restricting access to a means of suicide often results in less loss of life, said suicide prevention expert Lisa Firestone. Bridge barriers serve a similar function for reducing suicide, Firestone said. “They don’t make people less suicidal but they do make it so that, in that impulsive moment when someone is thinking of taking their life, it’s not easily accessible,” she said. Peer-reviewed studies appear to support the efficacy of bridge barriers. According to a 2007 study in The British Journal of Psychology, the installation of barriers at the Clifton suspension bridge did not result in additional suicides at other nearby bridges. Most suicidal states are temporary and treatable and around 90 percent of people who attempt suicide will go on without any further attempts, Firestone said. Decreasing access to firearms and setting daily purchase limits on the amounts of certain over-the-counter drugs has also been linked to a decrease in suicides. 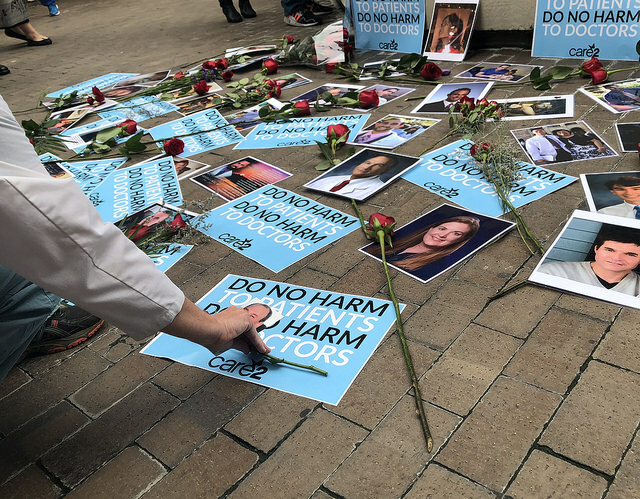 While Port Authority officials have taken some measures that suicide researchers have urged – like posting signs urging suicidal people to call a crisis hotline and placing phones along the pathway – Firestone insists those actions aren’t enough. The George Washington Bridge, which connects Washington Heights, Manhattan with Fort Lee, New Jersey has been the site of scores of suicides in recent years. Photo by Razi Syed. Over the past five months, two claims have been filed against the Port Authority which decry the lack of barriers at the George Washington Bridge. One claim was filed on Dec. 16 by the Vera Lomtevas, whose 17-year-old son, Daniel, jumped off the George Washington early morning on Oct. 5, 2016. According to court records, Lomtevas slipped out of his Dyker Heights home around 4 a.m. Minutes later, he hailed an Uber to take him 2111 86th St., Brooklyn and boarded the D train towards Manhattan. At 7:16 a.m., according to photo metadata, Lomtevas took a picture looking over the Hudson around the start of the southern bridge pathway. By 7:38 a.m. his unconscious body was brought to New York-Presbyterian hospital. He was pronounced dead 57 minutes after his arrival at the hospital. According to Peter Lomtevas, he was told a Port Authority officer had grabbed a hold of Lomtevas as he attempted to jump and that Lomtevas wriggled himself free and went over the railing. He claims the Port Authority hasn’t made the officer available to speak with him in the six months since his son’s death. Port Authority spokesman Scott Ladd declined to comment, citing pending litigation. In her complaint, Vera Lomtevas said that the New York Police Department had been called to the family home and arrived around 6 a.m., more than an hour before Lomtevas jumped. Vera Lomtevas said that using the “Find My iPhone” app, the family was able to trace her son’s movements as he made his way to the George Washington Bridge, and that family members repeatedly urged police to stop Lomtevas. They were allegedly told by officers not to worry and that Lomtevas would be stopped. Despite those assurances, NYPD and the Port Authority allowed Lomtevas to walk on the ascending walkway and halfway across the span of the southern pedestrian pathway without being challenged in any way, the complaint contends. NYPD failed to respond to a request for comment by the time of publication. According to a copy of his autopsy report, Lomtevas died of blunt force trauma to his torso, head and neck. The lungs were reportedly normal, without much water inside them, suggesting he died on impact before his reflex to inhale kicked in. Lomtevas had always been a happy, easy-going and charming young man, according to his family. But the summer before his first year of college his demeanor began to change – which they only noticed looking in retrospect. During that summer, Lomtevas attempted suicide once in August, roughly six weeks prior to his death on Oct. 5 at the George Washington Bridge. Lomtevas grew up in Ozone Park, Queens and Dyker Heights, Brooklyn. 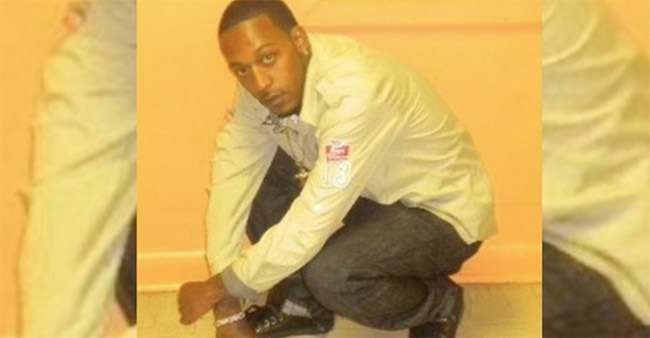 He attended Fort Hamilton High School, where he was in the honor society, and had just started his first semester at Brooklyn College at the time of his death. In a photo that ran in press reports of his death, Lomtevas is wearing black-rimmed glasses and a blue graduation gown, draped with a stole bearing the National Honor Society insignia. During his first suicide attempt, Lomtevas arrived at the Verrazano-Narrows Bridge early morning on Aug. 22 and climbed over the guardrail onto an engineering walkway. Once there, he called 911 pleading for help. After his rescue, Lomtevas admitted to police that he had attempted suicide and that a note would be found at his home. In his August suicide note, Lomtevas wrote that he had felt suicidal for years and that he didn’t believe mental health could be treated effectively yet. “We’ll all be forgotten someday and I prefer it sooner than later,” he wrote. A second claim, which was filed by Bay Ridge resident Eugena Perlov and her daughter Diana, was filed on Jan. 26 and contends that the suicide of their husband and father, Vladimir Perlov, was foreseeable to the Port Authority, given the large number of suicides in recent years, and that the Port Authority has not taken meaningful steps to address the issue. On the morning of Jan. 28, 2016, according to the complaint, Perlov drove on to the George Washington Bridge and pulled over, got out of his car and jumped from the north walkway. The impact of the fall caused severe damage to his torso and he died of his injuries at New York-Presbyterian/Allen Hospital. In 2014, as part of a plan to replace the suspension ropes on the bridge, the Port Authority approved up to $47 million to build a barrier along the walkway. Vera Lomtevas scoffed at the timeline the Port Authority has set for the construction of its barrier, which isn’t set to be completed until 2024. “How many more people are going to die in that time?” she asked. Firestone also believes the timeline is too slow. “If a study came out that said 18 people were going to die on the bridge next year because of a mechanical issue, they’d shut it down and fix it,” Firestone said, quoting a suicide prevention advocate and documentary filmmaker from a New York Times report on the George Washington Bridge. And while Firestone acknowledges that there are engineering hurdles that can take time to overcome, she questions why there hasn’t been any temporary fencing in the meantime. A chain-link fence had previously been placed on three bridges around Cornell University as a temporary barrier after several student suicides. With a national suicide rate that has climbed 24 percent from 1999 to 2014, Firestone said the need for suicide barriers has become urgent. Six months after their son’s death, Vera and Peter Lomtevas continue to wonder what led their son to feel he had no other choice. Based on medical research, Peter Lomtevas theorizes that a gene, SKA2, which influences how the brain responds to stress, may have contributed. Or, perhaps, that the antidepressant and antianxiety drugs, duloxetine and clonazepam, Lomtevas was prescribed around a week before his death could have driven him over the edge. But there is no definitive answer.